I took 2 weeks to strip the paint-on bituminised roofing product that had been applied to my car in the late 60's by the OO. It worked well but had gone hard, was cracking and needed to come off. The car has 'never seen rain' in its life reportedly and I went for pragmatism starting with a shiny metal base, a rust sealer/primer, and Wurth stoneguard, after a quality seam sealer. I am a driver (at least 1 or 2 times a week, 12 months a year). I love the look of concours show cars but keeping them that way would be too stressful for me. I am a preserver but the next custodian may have a different ambition. Bruce is this a Beck or McRae? It was at our meeting recently after a 1000km trip. I worked weekends in my dad's paint and body shop in the 50s. 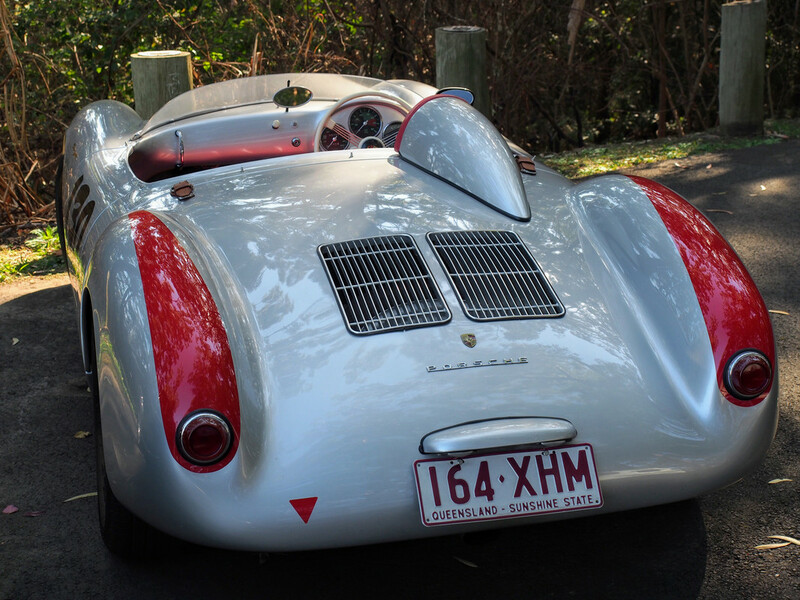 These were just Porsches in those days, not 356s. The original cars were head and shoulders over anything else coming through his shop. I'm sure some of us over-restore our cars, and I may be one of them. I do what I do, out of sheer satisfaction, nothing more. Just do the best, and most original job your capable of. As to undercoating, I paint the underside with Rustolum, then apply a very light coat of "Shutz". I just like the texture, and it does somewhat copy the factory. If done right, you'll never do it a second time. Without over-restored cars what would the trailer manufacturers do? but you can't restore patina. Sounds like there was a secondary theme here around the paint. I like single stage and believe it looks better. Like the original, it looks like it was dipped in the color. Solid colors actually have a very good gloss in Single stage. Base Coat/Clear coat has a distinct modern look. It does make spot repairs easier to color match but then still requires the entire panel be cleared if you follow the manufacturer instructions. Base coat with urethane clear (BC/CC) is not significantly better than single stage urethane (SSU). Both are catalyzed urethane and very UV stable and durable. The way these cars are pampered and stored, they won’t ever have a need to be redone if you use either product. I'd be happy with flat black primer. Forget restoring, just want to get mine back on the road. Martin Bruechle wrote: I'd be happy with flat black primer. Forget restoring, just want to get mine back on the road. +1,000. After 24 years, my car will soon be back on the road; a mechanically perfect eyesore. Paint (and the inevitable bodywork) may come someday. Meanwhile I won't even be able to spot new stone chips. I was in the United States Air Force, stationed in Chateauroux, France in the mid 1950's. Like many GI's I took up photography and would snap away. On a trip to Paris I was taken by this beautiful car and the play of shadows on the paint. My appreciation of 356 Porsches must have begun at that time. It also shows that if you compounded and buffed the paint in 1956 it would look pretty good for single-stage paint. The first couple of years of my ownership my car was flat black. After restoring it on and off for 25 years, it nearly came back that way again, as my main interest has always been driving it. It ended up shiny single-stage, but almost didn't. Rustoleum $50.oo paint jobs on youtube ! looks great, yes Wurth stone guard is a good product for the factory undercoated areas of the 356. Adam Wright wrote: Personally, I'm sick of over-restored cars. I went back and forth with my painter recently, he wanted to do base coat/clear coat. I said no, single stage. I didn't want it super shiny like a new Toyota. I was happy with the result, he probably still thinks I'm crazy. Completely agree, but I wouldn't call it "over restored" I would call it restored incorrectly and should have points removed in a concours inspection.